Societal Decisions: Societal decisions are everywhere and affect everyone. From from health care and education to public safety and the environment, it takes little more than a flip through a local newspaper to find examples of decisions that impact society. How can decision professionals help? Decision professionals use the principles of decision quality to help decision-makers and stakeholders identify areas of agreement and disagreement, create and analyze novel alternatives, and build consensus among stakeholders. Best practice examples:The links below highlight examples and best practices where decision professionals have added significant value to societal decisions. 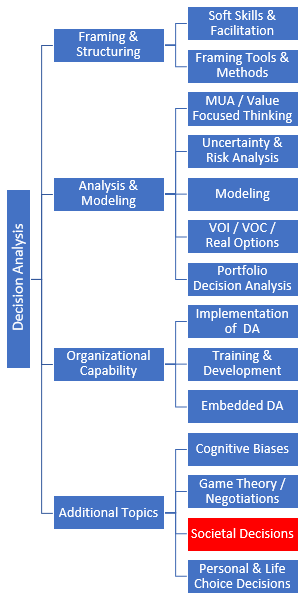 A multi-attribute decision analysis of options for decommissioning California’s offshore oil platforms. If you have any questions, comments, or suggestions for additional examples, please send us an email.